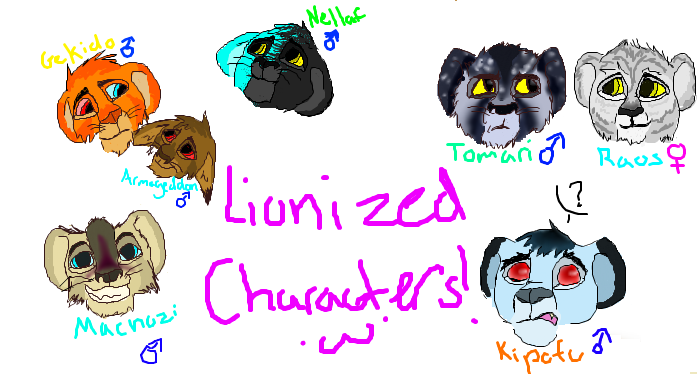 (*Many years later, after the rien of Simba's great-grandsons was long over, the great lion kingdom has fallen. All over the cub age have either been killed by the now-ruling hyenas, or died of sickness and hunger. Those under the death age are the first generation to learn under the laws of the canines, most becoming ruthless, bloodthirsty killers. But some have escaped their clutches of pure evil. They have set off into the outlands, surviving and planning as one. They are lead by the true heir to the thrown, and together they can hopefully overrun the ones who have stolen what they have known and loved. 1. Godmodding, flaming, trolling, or any other nonsense are not allowed. 4. Hyenas will be mostly played by me, but if you really want to be a bad guy, message me. Personality: strange, shy, and scatterbrained. Old Family: unknown, abandoned at birth because he was blind. "Under the law of the canines" means that we get to play as a canine like a wolf or dog (I'm confused 'cuz this suppos' to be a feline RP and "law of the canines" makes me think of canine 'cuz... it's written canine Dx) ? Under the Laws of Canines means that you are under the rule of the hyenasssssss. 83 I didnt know how to explain it that well, forgive me.. Personality: Chie is kindhearted and responsible, despite her young age and fragile look. She greatly respects everyone around her, no matter which side they are, because she knows that everyone has a reason to do what's good for them or for others. She hates to fight and tries her best in not get into a fight, even with the enemies, that she consider them "mislead", for that, she believes that they still have good reasons and are just misguided. Backround story: Chie was only one month when her mother got killed by hyenas and her brother, Byakko, was only a few weeks, still trying to learn how to hunt. Even though she was still very young, Chie almost got herself killed while trying to save her brother from the hyenas, but then she was rescued by other cubs and she eventually joined the rebels so that she can save her brother that many believe it was long lost because of the corruption from the hyenas. 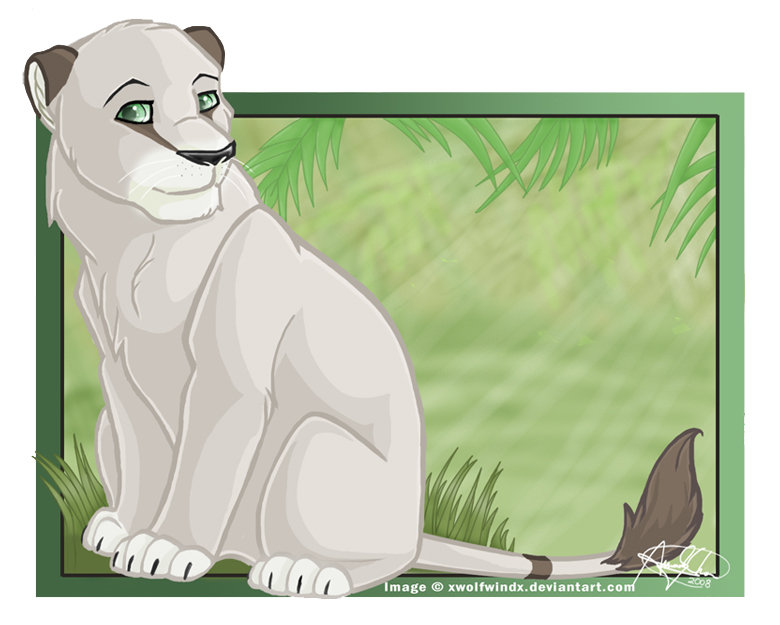 Personality: Byakko was reaised by the hyenas with lies about his sister, and because of that, he greatly hates her. He thinks Chie and his father abbandoned him when his mother got killed. 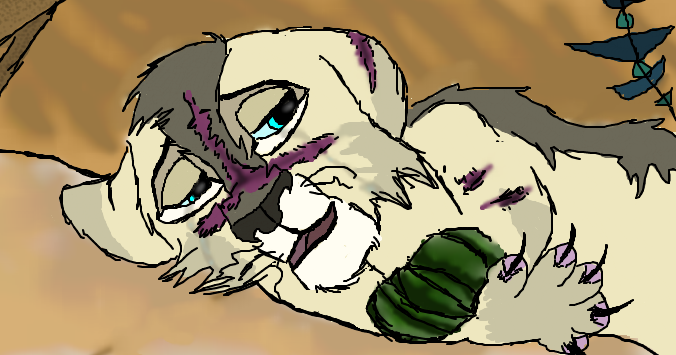 Even though he is ruthless and gets angry easily, Byakko still has a soft side and hesitates when a hyena orders him to do something like killing or similar, so he gets bullied a lot by the other lion cubs. Background story: Similar to Chie's. He got captured by the hyenas and, so that he can fit the group, was told many lies about how the other cubs left him to be eaten by the hyenas, but they "saved" him... Or so he believes. The setting sun clung(that a word? XD) to the horizon, it's firey blaze splattering crimson red onto the ground. A sand-colored cub sat quietly on a ledge, his tail flickering behind him. He was surrounded by termite infested towers. They were bent and dry, like everything in this forbidding place. Ever since the hyenas took over the pridelands, history had repeated itself. 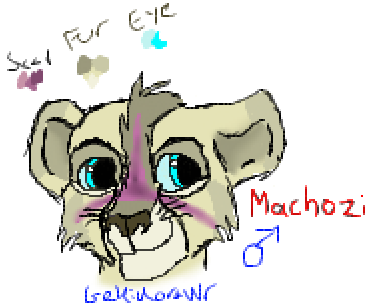 This cub, named Machozi, had heard of the terrible tales of his ancestor, Scar. His father, once the brave King of the Pridelands, had told him about how there was no food under the dark-maned lion's rule. It was barren, like now, without livestock. The plants had shriveled up into nothing but corpses. Machozi brushed away some dirt with his paws, revealing a wooden stick. It was bent on the top, with strange fruits hung from it. But those plants had too shriveled up with time, their shell soft and fragile. It had been his most prized item since the attack. It was given to him after he had met the Guru, Rafiki, very much bleeding and sick. The old monkey's words would echo in his ears until the mighty Pridelands were rightfully his. Crawl like a worm, my boy. Run. Run to get help. Run to save the pride. Run to save yourself. The young co-leader woke up amidst the other cubs sleeping all together. It was hard to breath, but Chie managed to put them all to one side without waking them up. After a long yawn, she saw that the leader was already up and decided to pay respect. "Good morning, Leader" Chie responded, bowing before him. "King or not, you still have authority." Chie calmly replied, standing up and staring at the sun "We may be fewer, but we're small and faster. Maybe not stronger, but hyenas are savage beasts with blood and violence on their mind. Their muscles are their brain. If we think, make plans and strike first, the enemy will go down." she sighed, still thinking of what she was saying. Was she babbling? She wasn't very good at this stuff, but she always tried to be optimistic "We also don't need to beat everyone... But rescue our brothers and sisters" she shook her head "Maybe we could make traps or something similar just to knock them down" Chie said, staring at Machozi. Since she never liked war nor killing, she always had a peaceful plan on her mind. Or negotiate or knock them down. "Hmmm..." Chie through for a moment "Maybe we could also try and search for more allies." "Who would join up with a bunch of cubs? ", Machozi pointed out, "I know we're strong and smart, but to the rest of the world, we are babies..." The male swung his growing mane to one side. "Though the traps might work. There is alot of dead trees and such to help us build. Go wake the others, if you don't mind." "Of course" Chie nodded, thinking about the male cub's opnion on her plans. Though it's true... Who would join a bunch of cubs? ...Other cubs, perhaps? The Co-Leader went from cub to cub, calmly waking them up and telling them to assemble next to the rock where the future King will discuss plans with them. "Morning Chie~", a large male liger cub with grey, striped fur purred, "How are you doing today?" "Lions of the Resistance. ", Machozi roared, gathering the groups of cubs around the tall rock. Determination glinted in the young lions' eyes. "A decision has been made. Me and Chie have decided to make traps for the hyenas. Therefore, if any canines come stooping around or an attack force comes... or even when we invade, we will be protected and slowly decrease the population of those wild dog's rule!" His tail lashed back and forth as the tiny pride yowled with agreement. "But first things first. ", the heir to the throne raised his paw to settle down. "We must get you all fed. I will lead a hunting patrol with Erut, Gnik, Redael, and Mlac." A hefty howl rang out from the barren walls, it's cry as powerful as the circling thunderstorm above. A big, black hyena erupted from the shadows, growling. "Cubs! ", he glared down at many faces, all meek and small. The supreme leader of Pride Rock, a well-muscled hyena, had called a meeting just that morning. A lightning flash lit up the walls, sending chills up the meek lions' backs. They couldn't understand why the Highest had to be so mean while the rest of the hyenas were always kind to them. Well, the rest were always kind to the Fighting Cabinet. The Fighting Cabinet was the highest rank you could get at cub-age. Those who were in that group were lean, mean, and powerful. They didn't think twice at killing. They obeyed without thought, without question. "Oh, good morning" Chie gave a carefree smile towards the black cub "I'm fine, what about you?" Before Chie would do another movement, Machozi went to hunt. Greatly worried about the heir throne, she quickly ran towards him "Please, be careful! We don't know what the hyenas might be planning. They may even have patrols stationed all around these areas, so the food might be scarce." she said, with worried eyes. 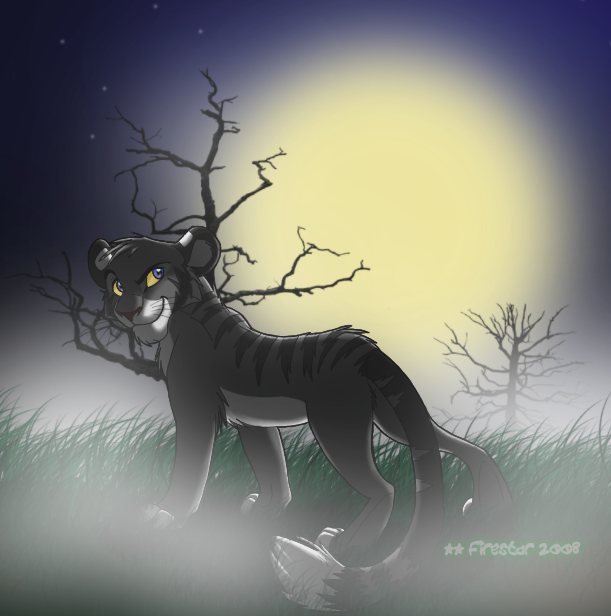 Byakko growled when he heard the leader of the Pride Rock screaming like a crazy old man. The young cub shook his head and stared at the supreme hyena with disgust. Even though he was the leader, Byakko still had a hate for him, because of his arrogant, agressive and violent personality. However, the lion cub kept telling himself that was good, but he still believed violence wasn't the answer for everything and tried his best to stay out of hyena's business, but he was always getting scowled. "He'll be fine, Chie. He's got the strongest cubs with him. ", Thistle reasoned, resting his tail on her shoulder, "And even if they do run into trouble, Machozi will use his wits against those bone heads." He turned Chie away from the leader, not liking how worried she sounded of the other male. "Trust me." Machozi gave a thankful glance at the black cub and rounded up his hunting group. "We are at the brink of a war! ", the alpha howled, baring his teeth. "We must be strong----stronger than those outcasts! Weakness and shortcuts will not be tolorated!" A scrawny female shivered next to Chie's brother. (forgot the name.. -fail-) She knew what the scary hyena was going to say. "And that means those who have been stealing food will be severly punished! Those who cannot fight cannot eat!" Chie sighed, still not convinced. "Alright... Maybe I'm worring too much." she said and sat down, looking at the sky in high hopes that they will return safely. 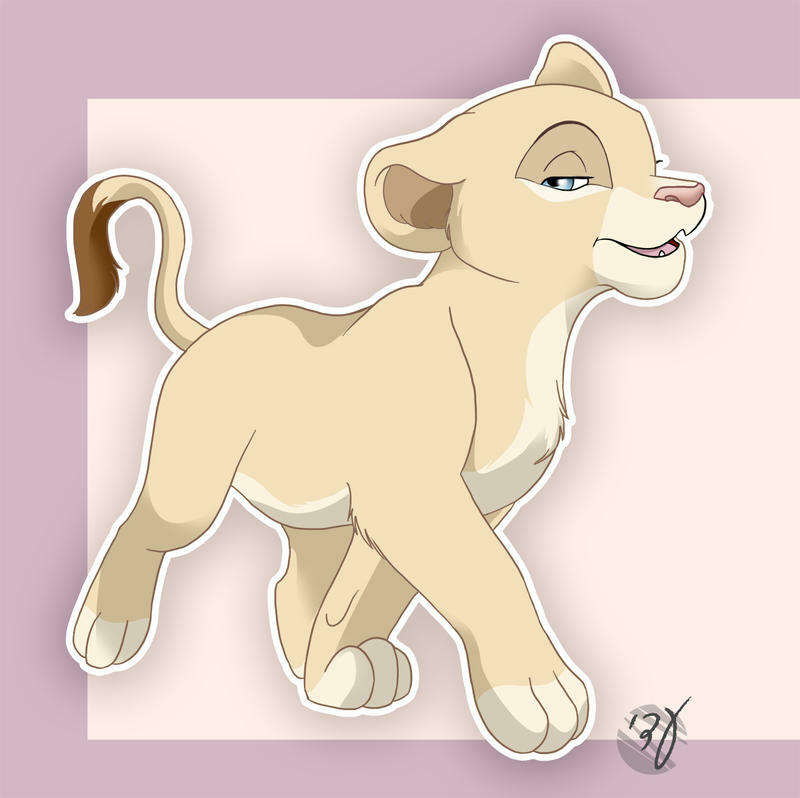 Byakko shook his head, bored "Gosh... What, is the 'supreme' leader in love with his own voice or what?" he sarcastically whispered to himself, not interested in those cliched discussions from the old hyena, Byakko just wanted to do some action.